Stacey, James, Peg, June, Kendall, Jessica, Brad, Trevor, Amy, Whitney, Joel, Jonathan, Meg, the list goes on. Mother measured the children. 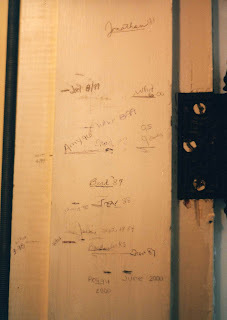 Upon opening the basement door, a row of names and years covering the door frame greeted you. The dates covered 1983 to 2000, the year mother died. Jonathan was a few inches taller than everyone else. Obviously, this was a Lavy boy. Mom and Dad tracked 'their kids'. When going through the papers after Mom was gone, we found a sheet of names, dates and measurements. 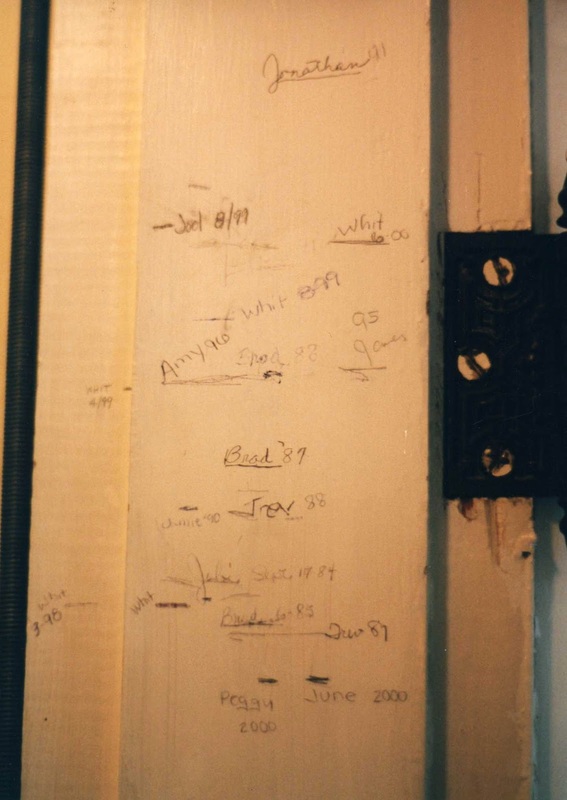 Evidently, Dad had copied the measuring wall before the doorway received a new coat of paint. John Marshall, Jobi, Lorraine, Eric, Betsy, Stacey, Steve, Trevor, Sue Ann, Keith and Brad all stood against that wall between 1971 and 1978. Stacey, my daughter, was just a toddler. The list of names and numbers had no worth only memories more for the child measured than those of us reading the list. Although it reminded me of how much my parents loved the children who visited them. I'm not too sure how safe it was standing a teetering child at the top of the stairs looking down to the basement's waiting concrete, yet time and time again they stood straight waiting to see if they were a bit taller than the last time they stood in that same spot. The wall has since been painted. I saw it on my last visit. The names and numbers still peek through the coat of paint. I have the list and pictures of the wall. For this daughter, they remind me that fine decorating of a home should consist of a wall of dates and names, a stairway lined with hand colored pictures, counter tops holding handmade gifts. Mother and Dad recognized children. Not always their own, but they did acknowledge the worth and goodness in each child. We stood at the top of the stairs, adult and child, while my mother or dad made the line above our heads. A name and date was added. I never caught up to those Lavy boys. And before I knew it, my son passed his mother’s height. Truly it was a history. A history of life back the lane on Neff Road. 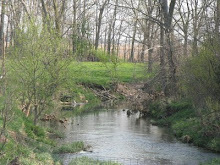 The creek that ran through our farm also ran through my grandfather's farm. 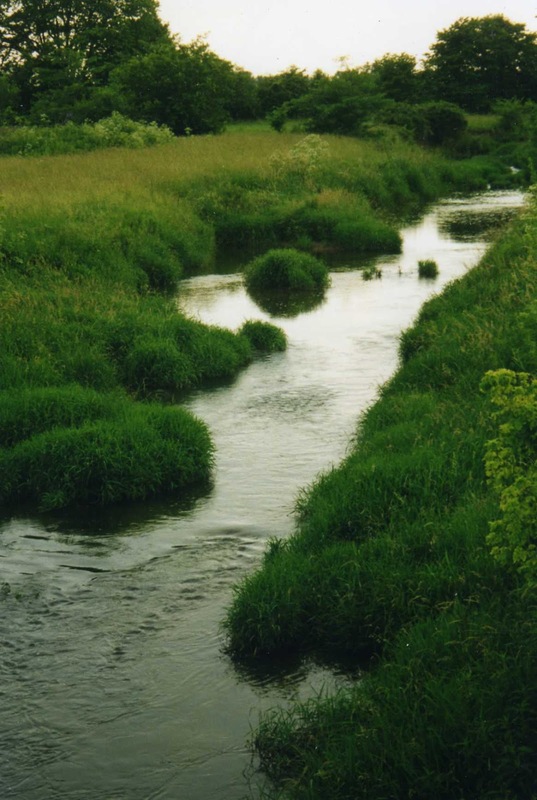 I was afraid to walk along it as a kid after we found a very long garter snake slithering on the creek's edge. The same creek where my father was raised saw his daughters raised as well. Grandmother Loxley wrote this poem. 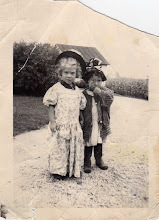 A poem about a mother and her daughter, my Aunt Esther. Just the kind to make you stroll and dream the hours away. And the treasures that we found were more than I can tell. But when he heard us call, scampered away so hastily. We named it "Peter", who tried the same, but made a flop. Then Solomon's temple with all its beaten brass and gold. And of the One Who gave to each an all-important part. I want my grandmother's writings to see the light of day once more. This little piggy probably did go to market and didn't go home. I am a country girl. I know where little piggies went. A mention on the news caught my attention. Neighbors were complaining about air pollution from the dairy farm. Air pollution. Oh, we are becoming a country of city folks. I sometimes forget that not everyone lived the rich life of a farmer. Some kids never see pigs and cows. Some people never know the smell that goes along with them. "Good 'ol country free air," Dad would say. At work yesterday I sold two oinking stuffed toys. We also have a basket of little oinking pig flashlights. Everyone loves the oinking pigs. I guess I should have paid more attention to the sounds enjoying them a bit more when I was a kid. Still, I am getting my chuckles from these people enjoying their pigs. Isn't it sad that kids don't know about farm animals, that it takes an artificial pig to teach the sounds of the farm? Oh, now we have city farmers. Several of my friends are raising a few chickens so they can have fresh eggs. Roosters aren't allowed in town and some places do not allow even the hens. Yet on occasion I hear a squawking hen. And, I can drive down the street to the farm store, on the edge of town and pet a baby chick. What has happened to the small farm where a few cows hung out in the barn. Sheep grazed in the barnyard keeping the grass mowed down. A coop full of chickens kept the eggs rolling and fresh meat on the table. Maybe I write this blog to keep alive the rich past that is indeed becoming more 'past' all the time. Maybe I write this in order to preserve memories that will pass when my generation of farm children passes, too. Darn it, we had it good. I must confess that I do on occasion make a stuffed pig oink or a purple chick peep. I like an instant visit home. Sometimes I even dance with a dancing chicken. Oh my, time to quit confessing. Wow! What a great name for a book! I already see a best seller. Well, maybe not. When my grandparents were young, the sheriff astride his horse was the law. Yet as with generations before, families handled their own problems. Or didn't. It was the way of it. I'm not here to air the family secrets, although it might make for some very interesting reading. No, this is about a way of life that seems long ago yet maybe not so far away. Families did not talk about their problems....not to each other or anyone outside of the family. What happened in the family stayed in the family. Discipline and punishment was meted out behind closed doors. Once in awhile a sheriff was paid to look the other way. Maybe a child was sent to live with a relative. Whipping as punishment was sometimes violent. A fatal accident explained away. It was different time. The law was decided inside the walls of the family home. Many suffered alone. Men had the upper hand and were the power in the family to do what they wanted in whatever way desired. Women often lead lives of fear and pain. Being taken care of was taught at an early age when you were a female. Finding a husband who could care for you was much more important than the word love. It was another time. Wasn't it? We've come a long way. Yet still some of the old ideas remain. Women and children are still neglected, abused. Violence remains hidden behind doors and in silence. Now we have sources to help these people....it is now just a matter breaking down those doors and giving those in need a helping hand. It is not as easy to ignore those who suffer. Neff Road was probably no different than any other road. We didn't see the sheriff. He no longer sat upon a horse anyway. We didn't talk about what happened in our homes. We weren't allowed to. What happened at home stayed at home. I think perhaps I learned to observe and question because of this silence. Those kids of the 60's decided it was time for change and have been talking since. It was the good 'ol days, yet it was a time of silence. Grandbabies will be joining our family this summer. Yes, babies. A boy and a girl. Something new for our family. This morning I stood in front of the bathroom mirror and began to laugh. I had a little conversation with Mom. "Hey, Mom, we're having twins," I said. "Wouldn't you just love it?!" Oh, yes, she would love the idea of two little great grandbabies coming to visit. 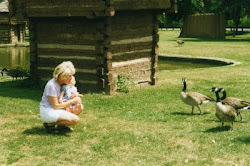 Knowing Mom, she would invite the entire county to come to the farm to see them. She would probably dig out the old stoller which also doubled as a baby buggy. 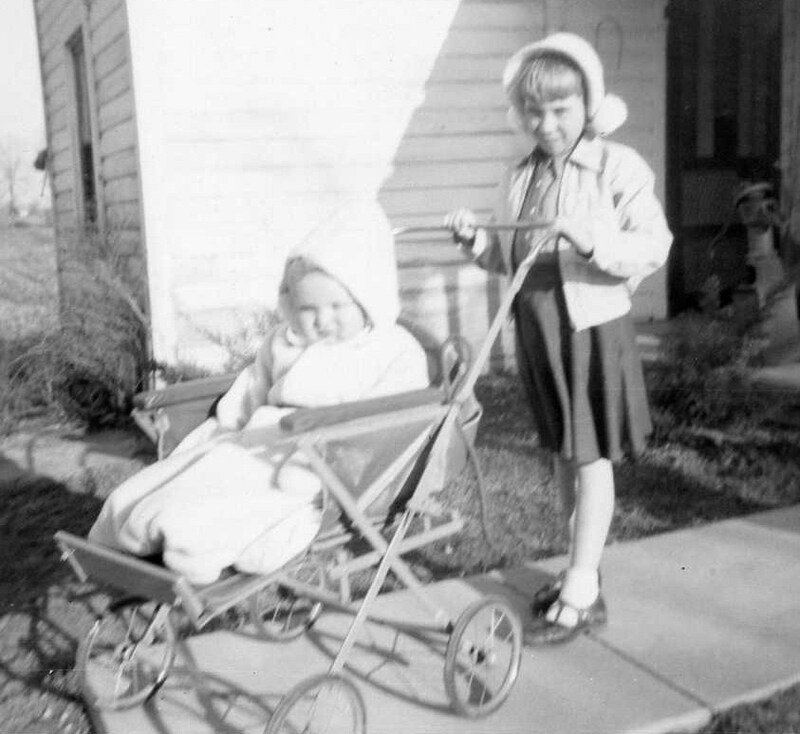 It was the buggy June rode in when she was sick and the one that probably carried each Loxley girl. I came across an old picture mixed in with all of the pictures called "unknowns". The buggy is so lovely. I can imagine a mother in her long dress, wearing a beautiful hat, pushing her child down the sidewalk greeting those she passed. (Perhaps I have watched too many movies.) My Aunt Esther had a doll buggy that resembled this one. 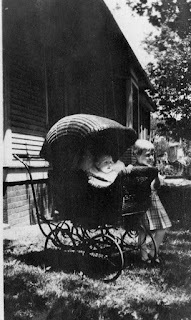 I imagine that my parents had been pushed in such a buggy. Grace and beauty of another era. Mom would chuckle at all of the bells and whistles on stollers today. A cup holder, a cell phone holder, a parent pack, seats that can face all directions except down, strollers for two babies, a place for everything and everything in its place. Then, you can even buy more accessories. Hm. I think perhaps Mom would tell me something I already know. The best accessory, in fact the only one needed, is a beautiful baby. In our case, two. Well, Mom, I know you are sending them to us with your blessing. I know I will greet them as I did when Gabby came onto the scene. I will kiss their downy heads and say, "Mom, I know you already kissed them. Now its my turn." I sat by her bed when I was but a toddler. 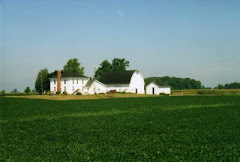 She laid beneath the windows in the diningroom of the Loxley homestead. My grandmother was dying of cancer. Glimpses are all I have of this woman. 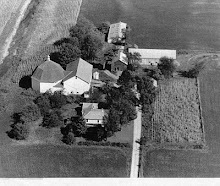 She taught in a one room school house on the corner of Byreley and Neff Roads. Her children would attend the same school. It was just down the lane and across the bridge from her home where she raised her three sons and one daughter. Where she cooked for Isaiah on the old Kalamazoo Stove. Over the years, I was often asked if I was Ethel's granddaughter. Upon answering, I was then given a long story as to the influence my grandmother had on the lives of others. One of my favorite teachers, Miss Rhoades told me of the love and respect she had for my grandmother. A woman who influenced her journey to the front of the classroom. 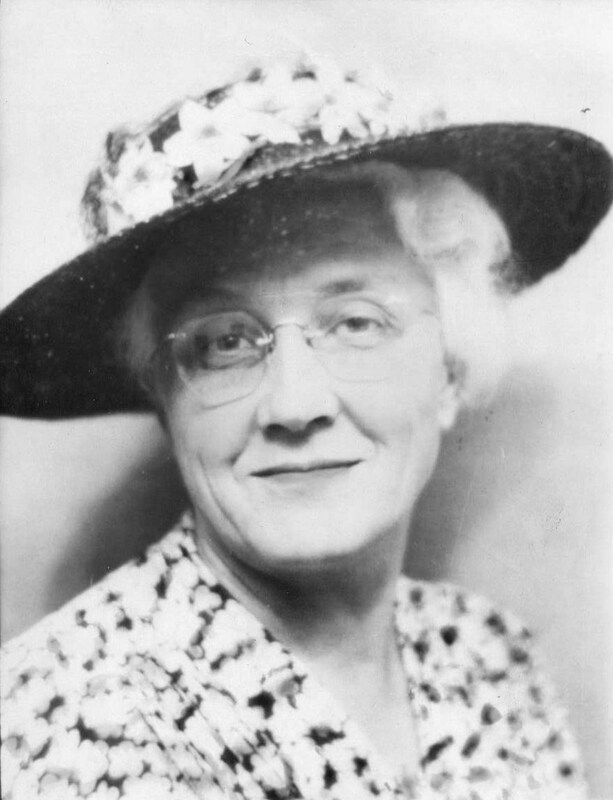 Even strangers seemed to know the name of Ethel Hollinger Loxley. My grandmother was poetess. She wrote of her faith and her love of nature. Several of her poems even found their way into the Greenville Daily Advocate. I like to think that my grandmother's work will once again sit upon the page in the Daily Advocate. I think she would be happy to be sharing a bit print with her granddaughter. When my grandmother passed away in that house where she raised her children, a neighbor said that she saw a white dove fly from the chimney. A spirit flying home. Someone mentioned old soap operas on the radio. But, yes, I remember the soaps that Mom, Dad, Aunt Welma and Uncle Bob listened to while the tobacco was stripped. The radio that crackled sitting high in the corner of the shed. 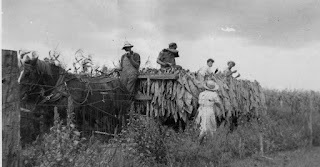 Sometimes I guess I talk about the tobacco crop a bit much, but it was our way of life. It was the crop that sustained our family and filled our year with work. The crop involved immediate family, extended family and sometimes neighbors. We didn't think of child labor. All farm kids work on farms. That's what farmers do. It is a wonderful life. The old way of bringing tobacco to the shed. 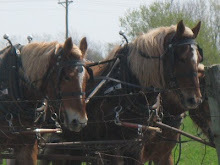 Young Dad driving horses. Uncle Keith behind him. Before they tore the old shed down, I wandered once more into the old strip shed. It still smelled of the dirt floor with a hint of tobacco tossed in. Now more a storage area for old odds and ends. 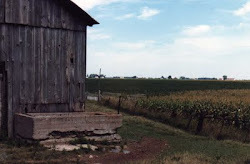 I think perhaps I still heard the voices once laughing inside those old boards on sides the shed. 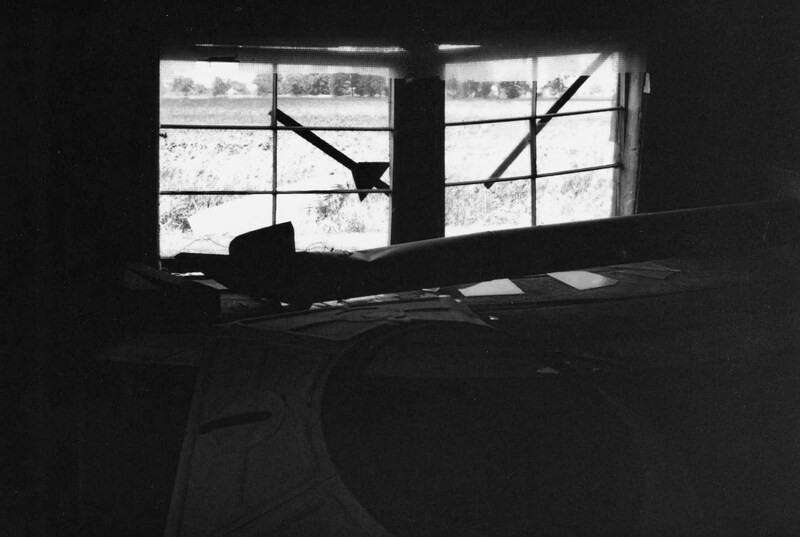 Old memories were captured in the flash of a camera in a darkened barn. I don't remember the old soap operas, but I remember the voices of my family singing along with the radio while their toddler daughter slept beneath the bench. A sound of comfort. A sound from my lovely past. He sat upon a bronco. Arm in the air and riding for his life. Well, so I thought when I was little kid. I'm sure my family had their chuckles watching me ooo and ahhh over the picture, wondering how Uncle Bob could stay atop that wild horse. 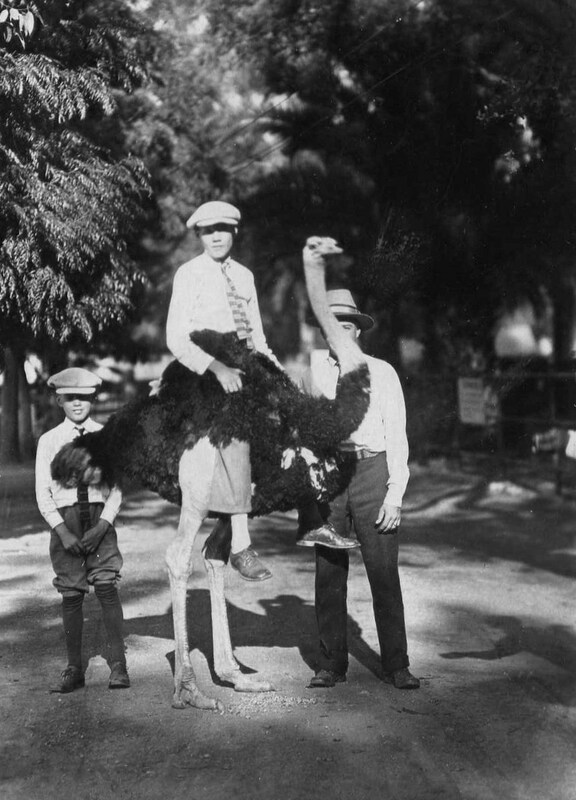 My father sat upon an ostrich. (Wonder how he got up there?) As a little kid, I didn't blink an eye thinking that my dad sat upon the large bird. The bird seemed content. Obviously, the bird was in the hands of a handler. (so I thought back then). Little did I know that if the bird were alive and took off running, Dad would be in the next state before they caught him. It's not nice to fool a little kid. My uncle, the bronco rider, wearing a white shirt and slacks was my hero. 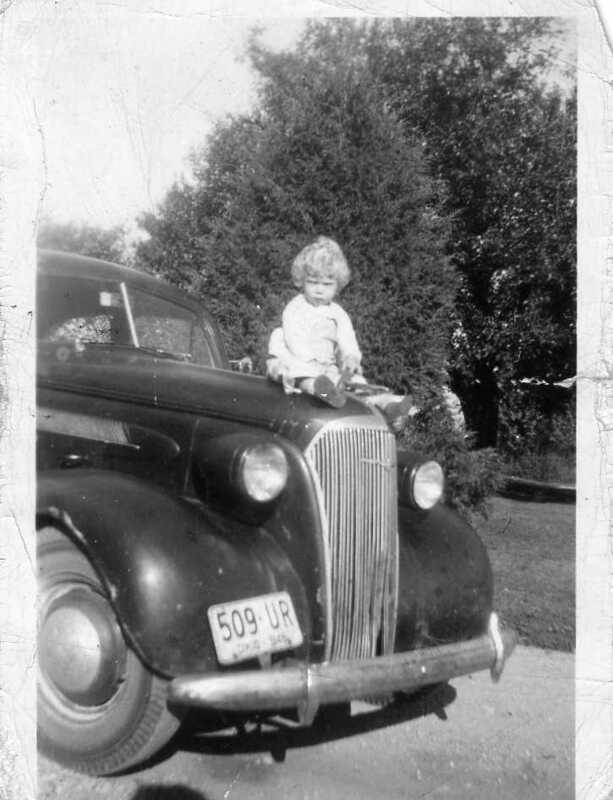 Dad sitting upon a wild bird seemed to fit with the Hollinger side of the family. But that exotic side of adventure was not to be. I'm not sure where these photo shots were taken. Not sure if the creatures were stuffed or some realistic creations. But a little girl had her dreams of following in their footsteps. I sat on my horse. I ran over a bird with my car. Hm. Again, I say, "Hm." It is a little known fact that I have the gift gab. I love people and find that I have a lot to meet before I meet my Maker. Never do I miss an opportunity to add someone new to my life, to cross them off the list of 'unknown people' and add them to the 'now I know them' list. "Welcome to Hallmark," I said with my usual greeting. Policy: Welcome customers into the store; Check on them regularly; Be friendly. Well, with my previously mentioned gift, this all comes easily. "Are you finding what you need?" I asked. "I'm looking for a card to send to Ohio." Hm. A look of shiftiness sneaks out from behind my pleasant facade. Shall I go for the straight attack or sneak attack. Sneak attack: "Ohio? What part of Ohio?" I asked with a casual interest. She hadn't caught on yet. Straight attack: "I grew up outside of Greenville!" "I know that area!" she was catching on quickly now. "I grew up in Kettering and went to Wright State." "I went to Wright State!" I shared, losing all control of the conversation, let alone my job. "When did you graduate from high school?" "1965," she answered with enthusiasm. "So did I!" I exclaimed. "We would have been there at the same time!" We had moved on from the customer/sales associate relationship into a Buckeye moment. "My husband went there, too, until we moved out here." "When did you move to Portland?!" the gift of gab was really paying off. Oregon is a long way from Ohio. Yet I found Neff Road right there in the birthday card aisle of the Hallmark store. I'm having coffee with her and her husband next week. Two more people off my list and a bizillion to go. "Hi, welcome to Hallmark....."
I am in great need of spring. Trees are budding. Today I smelled daphne on the air. I didn't need a sweater to go outside. Spring is in the air....I want it to stay. I didn't really think about the change of season when I was growing up on Neff Road. One just passed and another came along. 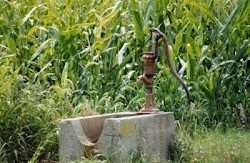 Usually it was marked by the crops either going into the soil or coming out of it. With the passing of one grade to another. With the wearing of clothes...shoes off/shoes on. A fat frog began croaking last week. I'm sure he is calling for a mate. One croaking frog isn't too bad; however..... Oh, yes, when he finds his girlfriend things will change. The smell of fresh mowed grass will fill the air. Pollen will make my nose run and will cling to the screens. A hummingbird has already found the feeder. Soon its friends will come to visit. Spring is in the wind. I would like to be back on the farm about now. The birds would come back to the feeder. Dad would be sharpening the plow. Baby lambs would be chasing one another and their wooly mothers. I wish I was back on the farm. Perhaps we count our years by the changing seasons. How many winters we have seen. How many summer sunsets. Perhaps we count the passing time by the memories of a warm spring sun calling to a sleeping earth, calling her awake once more. Perhaps spring calls me back...back to Neff Road. So I moved from the Senior Page to the Commentary Page. Perhaps I am no longer a senior. Perhaps I really do have something to say. Perhaps there was no place else to put the column with the new changes at the Advocate. I'm not sure where my senior page has gone. Heaven only knows that newpapers need advertisers. Small papers go under every day. The Advocate has tried to keep up with the times becoming more progressive. A new look for an old paper. I have two concerns. First of all, I think the Senior Page is a vital page of the paper. There are many who do not have computer skills much less have access to one. Seniors need to know that they are a vital part of a community. Those living in retirement and health facilities need to know that the community still wants to include them. It seems the older we get we feel we are thought of less. It is important to have articles that pertain to aging and things that seniors can do for entertainment. Retirees finally have time to do more. They are more than likely a part of a growing active family. They want to be informed on how to be part of their children's lives. We are living longer and live younger lives at an older age. Neff Road (Darke County) is changing. Companies are moving in which is a real blessing for the economy. 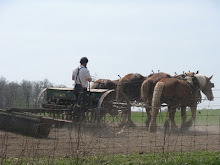 Yet, we are a people who have clung to our deeply embedded farm roots. We are interested in how to raise better crops. Excited when a new type of tractor comes up on the market. We love our small town shopping and stores that have been part of the landscape for decades. There are fewer and fewer pods of small communities across the map. They are indeed a treasure. 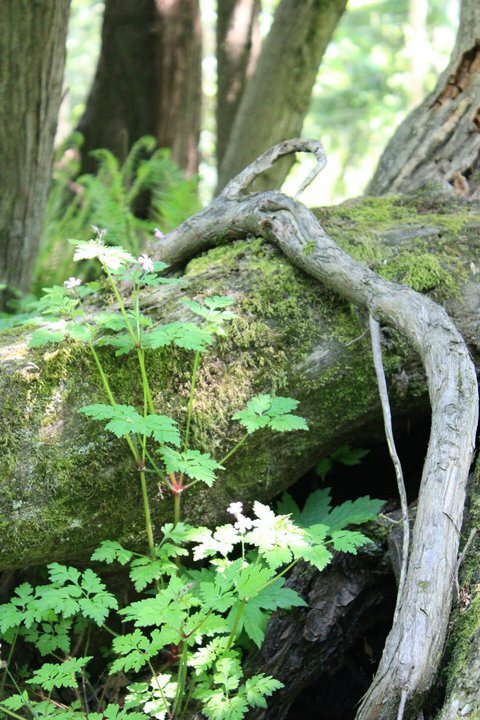 Progress should ignore the roots that have held this community together. So I'm now on the Commentary page. I think I just commentated. I'm not sure how good I am at it. I think I like Neff Road history better. Hm. I wonder if anyone will find me since I've moved from Saturday to Tuesday. Hm. I wonder.